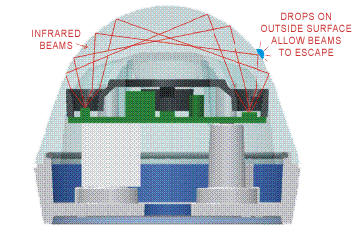 The RG-11 is optical– not mechanical, chemical, or conductive. Consequently, it is far more rugged, sensitive and reliable than any other technology. The sensor is extremely sensitive, and virtually immune to false trips. Yet, it is completely unaffected by jostling and motion. There are no exposed conductors to corrode, and no openings for bugs to crawl into. There is no place for leaves or other debris to collect. You can use the RG-11 to reliably detect condensation or frost. The RG-11 Rain Gauge measures both rain accumulation and rain intensity. 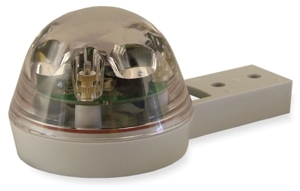 The RG-11 may also provide drop detection for your own external data interpretation. The Rain Gauge circuit board. The DIP switch programs the mode, and connections are made with convenient screw terminals. 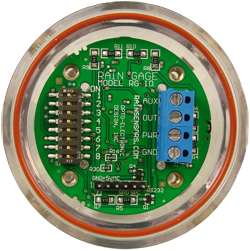 In this mode, the Rain Gauge continuously monitors the clarity of the sensing surface. This mode will control the wipers from off through intermittent and steady-slow speeds. This mode will measure both rain accumulation and rain intensity. Use this mode if you want to do your own external data interpretation.